We do not currently have Apprenticeships in care support roles. The Trust recruits directly to Healthcare Assistant (HCA) roles these are extremely popular. We run recruitment events on a regular basis these are advertised on the Trust recruitment website: www.belongtosomething.co.uk. The advert contains details of the date of the next HCA Information session, links to the application form and closing date for applications. Prior to submitting an application for these posts you must attend an HCA Information session and will need to book a place details of how to do this is in the advert. The session aims to outline the role in more detail, gives information about the Trust, the posts available at the time and may entail taking a test. Immediately following the event applications can be submitted, providing the appropriate tests have been passed. Shortlisting and interviews then select suitable candidates and match to the vacancies available, which could be in a variety of Wards & Departments at any of our sites. Successful candidates can express a preference for where they work. Opportunities also exist on the HCA Bank managed through the Temporary Staffing Department. Here staff are recruited to work flexibly to suit both their other commitments and the demands from the Wards and Departments where there are staffing shortfalls. This could be just evenings and weekends up to regular fulltime hours. 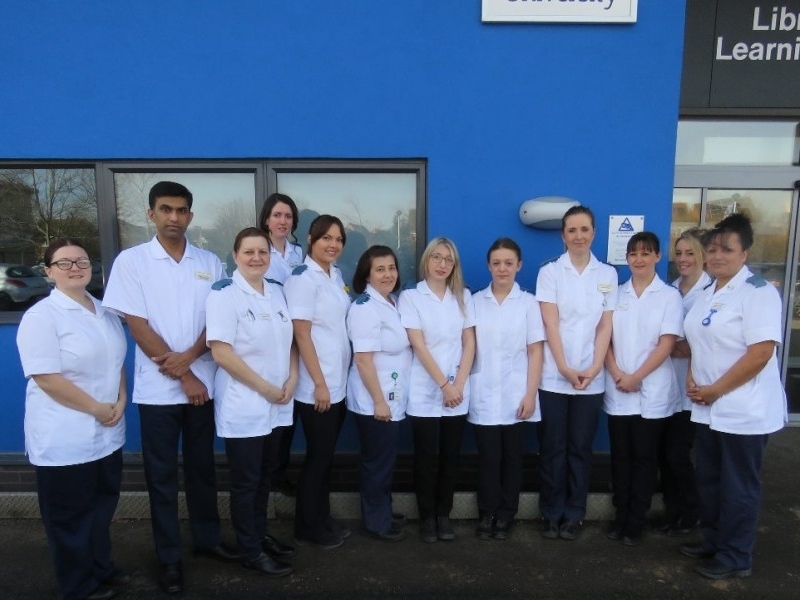 A thorough Induction programme is in place together with the opportunity for those ‘new to care’ to undertake the Care Certificate and the opportunity for all Healthcare Assistants to attain the Healthcare Support Worker apprenticeship qualification. There is a proposal to create some Healthcare Support Worker rotational apprenticeship roles across Shropshire during 2018. These roles will be across the Shropshire Health economy, but Apprentices will be based near to their home location. The 12-month Apprenticeship will entail placements in a variety of health & care environments to give a rounded experience including an Acute Trust (Shrewsbury, Telford or Oswestry), Community Health (e.g. District Nursing, Community Hospitals), Nursing and Residential Homes, Home (Domiciliary) Care. These posts will be advertised on our recruitment website when launched: www.belongtosomething.co.uk or NHS Jobs. On completion of the Apprenticeship, the student will have sought-after skills and experience and will be supported to apply for permanent roles with any of the care providers mentioned above. After a national pilot (which SaTH was part of) the Nursing Associate role has been established nationally. 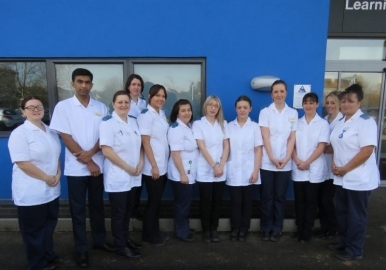 Trainees for the role are 'employed' by Trusts as Trainee Nursing Associates. The underpinning training course provided by Universities launched in early 2018. The Apprenticeship Standard at educational level 5 equates to a Foundation Degree. Some of the local Universities are approved to offer the course which lasts for 2 – 2½ years. All training is paid for by the Trust through the Apprenticeship Levy therefore, the trainee has no tuition fees to pay. The Trainee spends 1 day per week at University with the remainder of the working week 'in practice' within wards and clinical departments across the Trust and through placements in external healthcare environments to broaden their knowledge, skills and experience. Initially, recruits for the first cohorts have been drawn from our existing Healthcare Assistants employed within the Trust who have a desire to progress their career. Eventually, recruits will also be drawn from outside the organisation and opportunities will be advertised on this website and NHS Jobs. The rate of pay is being formulated nationally and will be contained within the job advert when opportunities are available. Entry criteria includes Maths & English Level 2 (i.e. GCSE A -C (9 -4) or equivalent). For those who do not already have these qualifications, local colleges can provide support to achieve them. The Registered Nurse Degree Apprenticeship is now available. Universities are now able to offer the underpinning qualification. There is a similar employment model to the Nursing Associate but a degree level qualification to underpin the role; this will take up to 4 years to achieve. Someone who has followed the Nursing Associate route may get some exemptions against the Nursing degree and therefore shorten the training period. Entry criteria includes Maths & English Level 2 (i.e. GCSE A -C (9 -4) or equivalent). There will continue to be the traditional full-time University route for the Nurse Degree, but nationally it appears that this is being undersubscribed possibly due to the Apprenticeship route becoming available which will negate the need for a student loan. In future the Trust may offer both Nurse Associate and Registered Nurse Apprenticeship opportunities as direct entry, however, experience in an HCA role gives an insight into the real job before committing further and excellent skills to build on if deciding to progress. There is also a proposal nationally for recruits to all nurse training to have 12 months HCA experience and exposure in the workplace to build on. All opportunities will be advertised on the Trust recruitment website: www.belongtosomething.co.uk or NHS Jobs. It is possible to set up alerts to your e-mail inbox as soon as a specific type of post is advertised e.g. 'Nursing Associate' or 'Registered Nurse Apprentice' - it may be wise to add 'Apprentice' to ensure you get all the alerts. Work experience is available for School and College students. Work placements may be of interest to people who are no longer in education who are considering their career options and may want exposure to NHS roles to help guide their thoughts and choices. For opportunities within the Trust please go initially to the following link where you will find a 'directory' of all opportunities available and an application form: https://www.sath.nhs.uk/working-with-us/work-experience-opportunities/. To discuss further opportunities and options please contact one of the people named below.